Checking my photos from day 2 at the World Championship and there really wasn’t much to show for it. Looks like I wasn’t the only one with equipment in the rain issues though. If day 1 was Ladies Day then today must be Gentleman’s Day, yes? Again, the bus drops us just in time for the Men’s U23 race. I didn’t see The Guys so I just grabbed a coffee and headed to the wooded part of the course towards the little chapel on the hill. Not being a professional photographer, with the ‘No Crossing’ rule you really have to pick your spot carefully if you want more than the same pics of the same people just different lap. 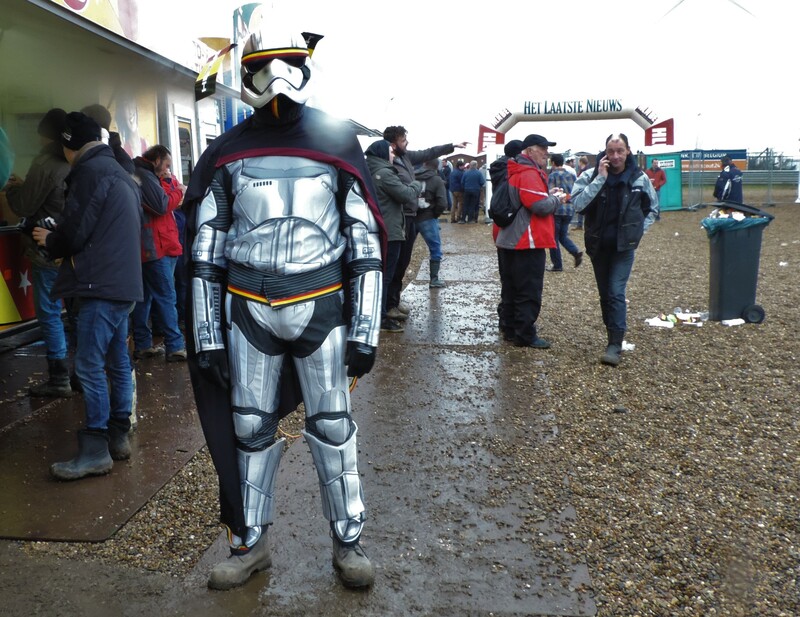 Of course, as I am not a professional, I also get rather carried away with the racing and still have trouble juggling rain poncho, back pack and camera with clapping and shouting and standing on tiptoes to see riders or the screen. 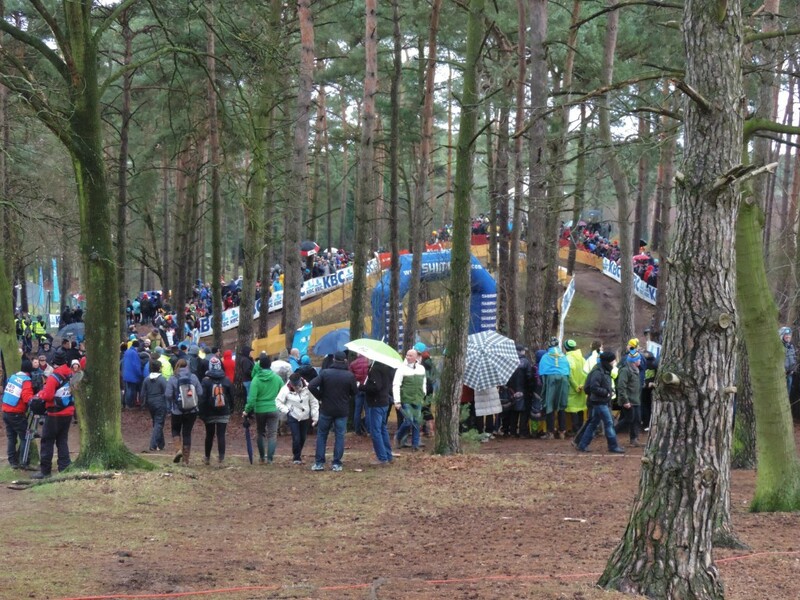 Although I am not enamoured with this course overall, I do love this section with the windy paths through the trees, the steep drop off to the beer tent, the steep slippery hill and the wiggly-windy bit through the woods. Standing on the steep part there are 2 screens plus we can see right over to the first 180 turn, the pits and the big bridge. Some people must have got here early as the smell of beery breath is quite evident, but everyone is in good spirits and anticipating a couple of really good races. We don’t have to wait long for the excitement. I’m really feeling for Gioele Bertolini who hit the deck on several occasions and not all his own fault. It probably wasn’t a course that really suited him, but he had a great season and we love to see the Italian fans (and the coaching staff!) who are extremely vocal. 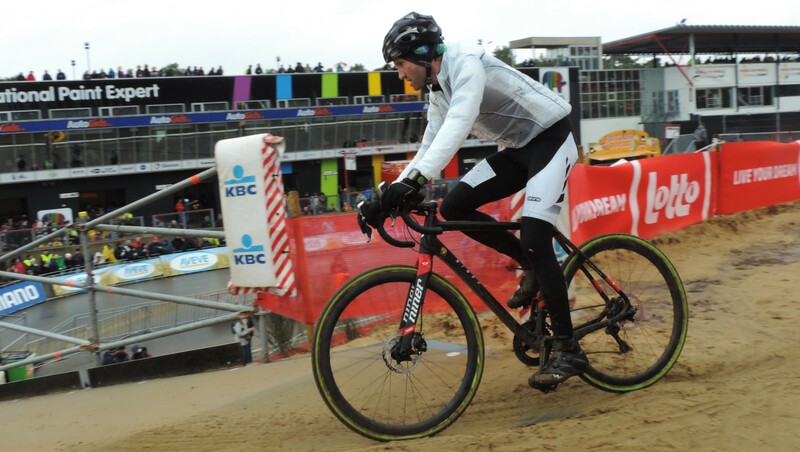 It was Daan Soete who took the bull by the horns and got the Belgian crowd going for the first couple of laps. After that though it was Eli Iserbyt, Quinten Hermans and Adam Toupalik who pulled away from the rest for a 3-way battle. If you haven’t seen this race already then what the hell have you been doing? It was a Quinten leads Adam, then Adam leads Quinten, then Eli joins them and then, with one lap to go, Adam thought it was all over and sprinted for the line and was celebrating away whilst the others ignored him and just carried on. Standing on the lttle hill with a few thousand others watching the big screen there was a moment when we were dumbstruck, then a little down while we also thought maybe he had won and then laughter as we too realised there was still one to go. With the bell ringing in his ears and no doubt feeling like a right wally, Adam got back up to the front and still had enough left to make another fight and what a fight it was. My goodness we were gripped to the screens and really weren’t sure, from the head-on camera angle until Eli started to celebrate, that he had actually managed to pass Adam in the sprint. OK, personally I would have preferred Quinten winning, but there’s really no particular reason. Eli has really made his presence felt since moving up to U23 class this year and he will be a superb World Champ too; possibly for a few years to come. 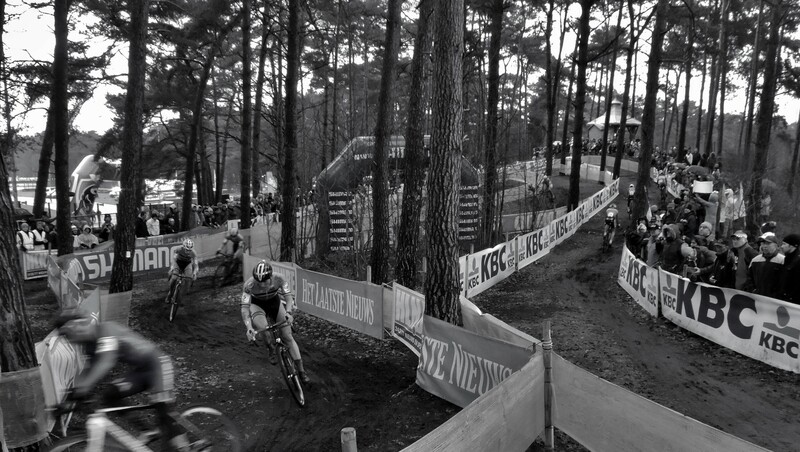 I still wish that Michael Vanthourenhout and Laurens Sweeck had stayed U23 for this season. That would have been some racing! Feeling a little sorry for Adam missing out like that, but he’s still got a place on my imaginary teenage girl’s bedroom wall! For the first time this championship we get to hear La Brabanconne for the podium. 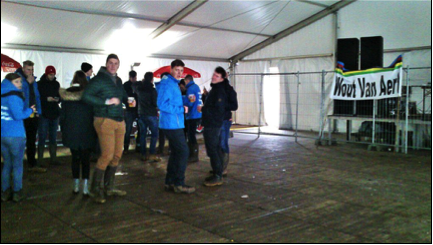 Back to beer tent #3 and TG’s are there so we grab a coffee and go for a wander to the campervans on the way we pop into beer tent #4 where the Wout fans were setting up camp and there was Papa Wellens, YAY! Keep going past the motor-racing pits, keep on to the car park, keep going through and YAY! we finally find Angus Edmond, the sole representative of Team New Zealand. Actually, he’s about 100m closer to the course than normal! As he headed out to the course to practice we headed the same way. As TG’s claimed further ailments I left them by the big inflatable Rainbow Jersey and headed up the hill. 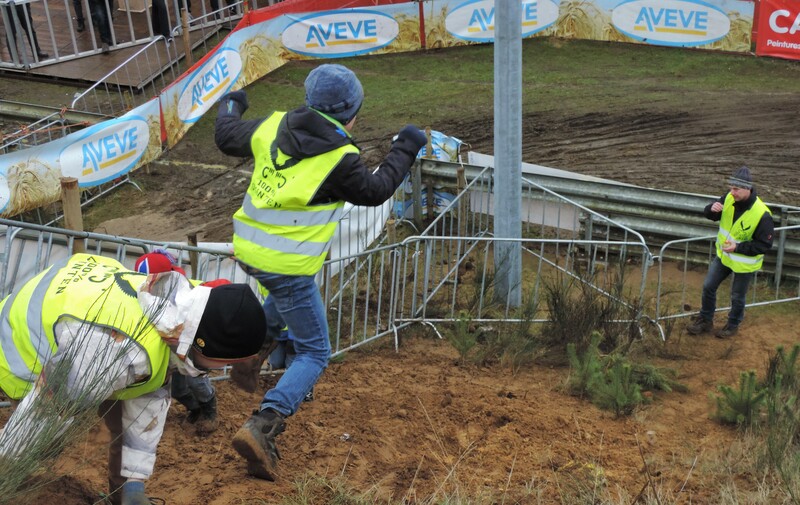 The only way to see the run-up is from the top so I got to see a few of the men giving it a go, but most impressive were the young Quinten Hermans supporters who were having a ball taking turns jumping down the hill (they did have adult supervision, don’t panic). Now would seem like a good moment for my 2cents about the Belgian selection. 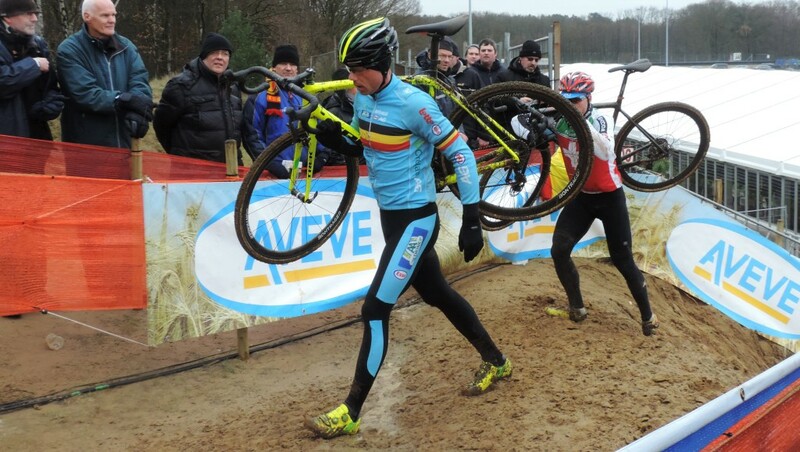 Obviously, Tim Merlier is a very lucky boy to have Wout van Aert as a friend. I can understand Toon Aerts frustration, but it was a bit too, little too late and there were others higher on the list. My choice would’ve been Gianni Vermeersch, who proves himself week after week to be the consumate team player prepared to bury himself for his teammates and getting precious little recognition for it (probably because the main beneficiary of his work is Kevin and a lot of people blur over him too!). OK, I’m done. So, after watching the men practice the run-up and the hill and they go back to their buses what is there to do, but wait. Yes, there are plenty of beer tents and I did get some food. I should’ve gone to the grandstand and had a sit down (yeah, hindsight! ), but I didn’t, it was just wandering, sponsors stallls, peeing, wandering, watching the camera fold sort out the boom and tweeting! Bored Now! Whoever came to the conclusion that having people wait around for 3 hours was a good idea needs to show their working (Teacher speak!) because no one else can follow their logic. At least it wasn’t raining. 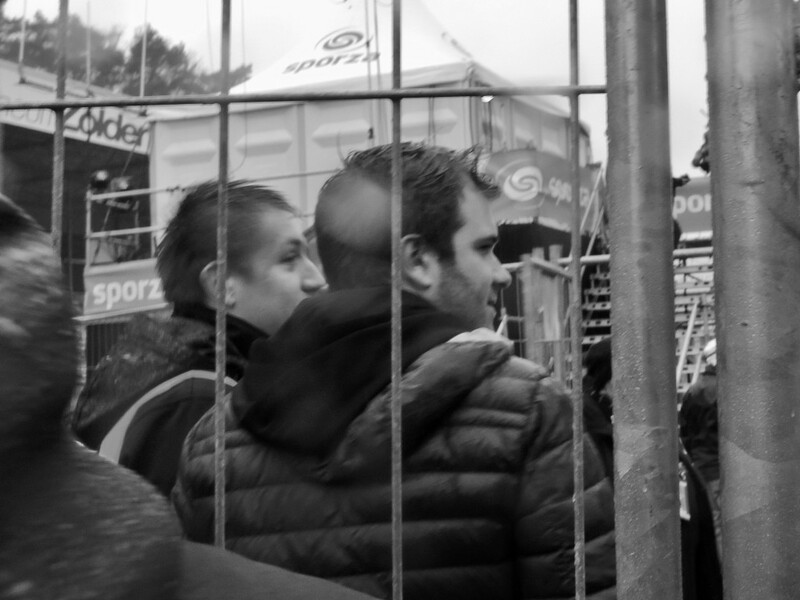 With about half an hour to the start of course the weather started to turn bad again while the crews start to make their ways to the pit and the spectators start to gather at the barriers. I found some K-Pauw sups that I have seen loads but never spoken to before and we are playing ‘rider spotting’ as they come past having a bit of ride by before the start. This is not so easy when they are all in national kits. 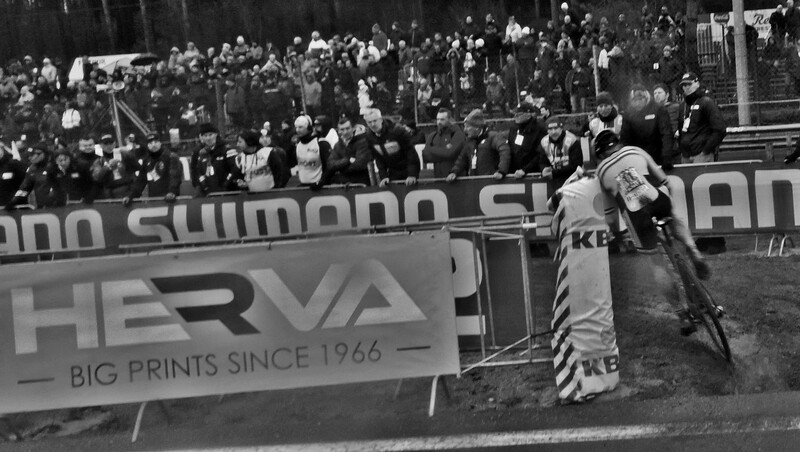 Billed as the battle between Mathieu van der Poel and Wout van Aert I had picked that they would take each other out and the podium would be Kevin, Sven and Lars! How close was that? Forgetting that I can’t move around the course once the race starts I am over by the start/finish straight so I missed catching up with TG’s again. However, I saw start/finish, 2nd 180 to the pits, entrance to the off-camber and the big screen. 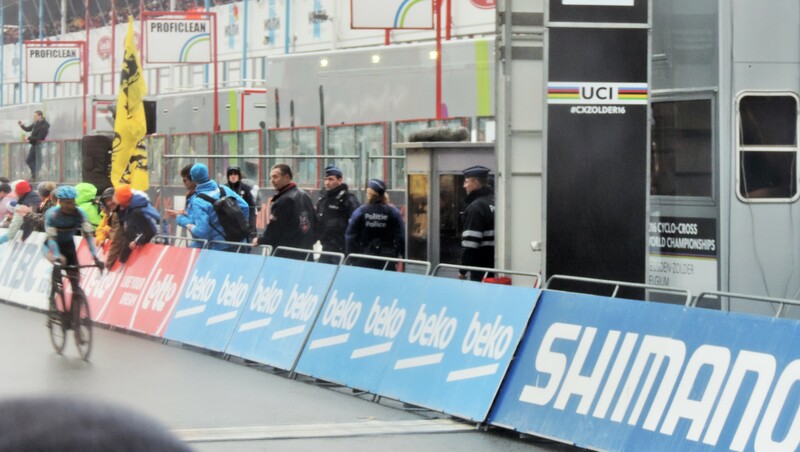 As a bonus there was another screen from the Shimano stall, albeit with one section that flickered irritatingly and the other blocks that were having colour issues. Tim Merlier tried to justify is selection straight off, but that was short-lived. I would just like to say that Angus’ pink socks are not standard New Zealand sports regular issue, but if NZ Cycling don’t chip in then what can they expect? 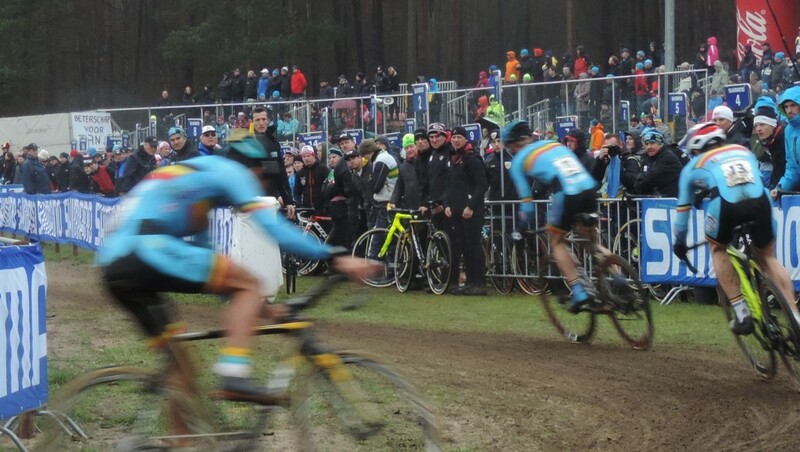 With my fellow damp but happy CX fans I ran back and forth taking crap out of focus pics for an hour. We OOOh-ed and AAAAh-ed in all the right places, tried to encourage from the sidelines and even had my heckling attempts recognised (Thanks Angus! I thought for about 6 laps that you’d actually finish this one. I can be impossibly optimistic!) If you haven’t seen this race then why are you reading this blog? 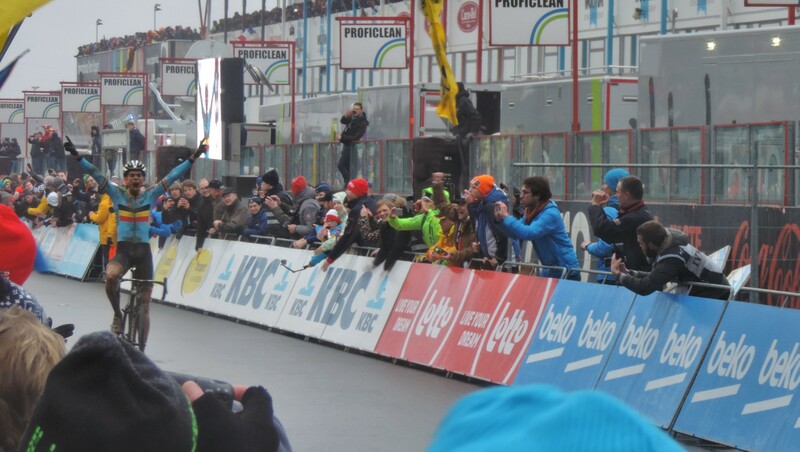 I did get a pic of Wout winning, missed Lars and this may not be the best photo ever taken, but it appears to be one of a very few taken of Kevin Pauwels crossing to finish 3rd while all other eyes were on Sven taking his bows and waving to the crowds. Sadly, there was no getting anywhere near the podium so I had to watch from the big screen outside beer tent #4 behind the stage and grab a few glimpses through the fence. i always forget how long the interview process takes and I dare say there was a need for some peeing into cups. I was going to wait to see Kevin after at the bus, but i was getting really cold and thought I’d better head to the bus before I froze. On the way out I happened to grab one last pic. Like my first pic this weekend was a GPON so was the last. As it should be. Well done Eli, Adam and Quinten. Well done Wout, Lars and, of course, Kevin. 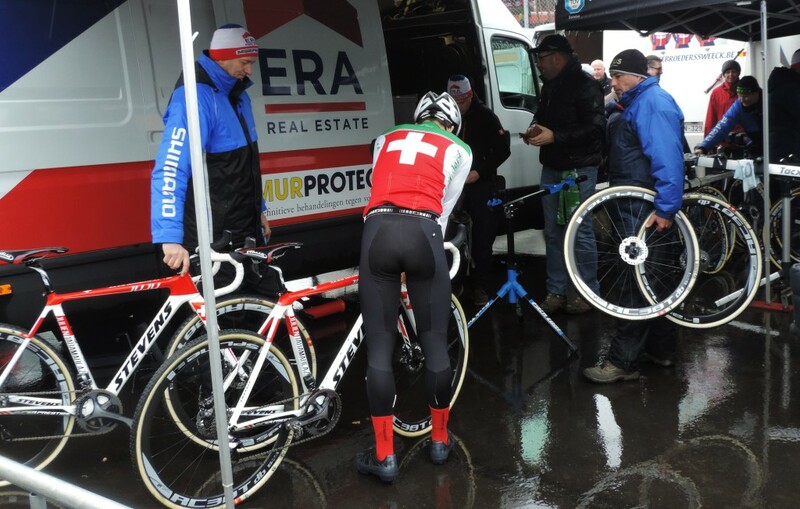 Goodbye to Sven in his last World Championship as a rider, although I am certain we will still see plenty of him in future. For me there were no chance meeting or adventures on the way home, except for the homeless woman who had my 2 euros that were destined for a vending machine waffle. I’m sure she made better use of them. Will my camera recover from this weekends’ misuse? 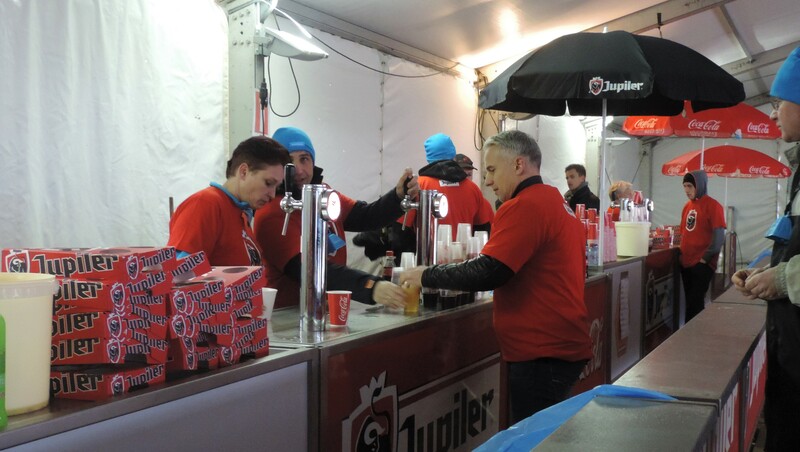 We shall see now that all this serious business of Rainbows is over and we can have some more fun at Sint Niklaas.